An unusually authentic historic reconstruction. It may seem a trite point to many that this historical drama is surprisingly authentic, but I find it very refreshing after seeing so many films throw details to the wind. There are very few movies, if any dealing with Britian's famous "Honorable East India Company", but the costuming on this movie was researched very well indeed. I think this fact alone holds a lot of the appeal as a 'History' buff's movie. I couldn't imagine Pierce Brosnan's tiger hunting scene to be much more accurate, as every detail seems excellent to me, especially the uniforms of the HEIC. I think that the movie captures the mystic of India very well and is generally based on true historic events. 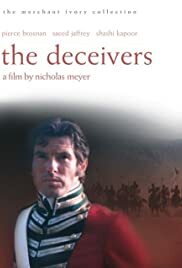 Whatever people think of Pierce Brosnans' acting ability, this movie has very good entertainment value, apart from showing a unique side of the history of India. My close associate shot a documentary in very remote parts of India, and many of this movie's scenes look similar today, though I doubt he experienced anything quite like the 'death by elephant' scene in today's India !